In 1578, William Bourne, a British mathematician and writer on naval subjects, designed the first "practical" submarine. 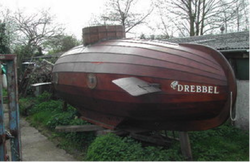 The submarine was a wooden framework bound in waterproofed leather. Although this idea never got beyond the drawing board until Cornelis Drebble, a Dutch inventor, built this first submarine in 1620. The boat was powered by rowers pulling on oars that sticked out through flexible leather seals in the hull. Snorkel air tubes were held above the surface, permitting several hours of submergence time, which answered the question of air replenishment underwater. Van Drebbel's boat successfully worked in the Thames River at depths of 12 to 15 feet below the surface, with twelve oarsmen and some other passengers on board. Despite its successful demonstration, this invention failed to interest the British Navy. When an object is been put in water, it will feel lighter than usual. In 212 B.C., the Greek scientist Archimedes discovered the following principle: an object is been put in a fluid is buoyed up by a force equal to the weight of the fluid displaced by the object. This became known as Archimede's principle. It is also a great way for measuring; it is called the displacement of water. The weight of the displaced fluid can be found mathematically. The fluid displaced has a weight W = mg. The mass can now be expressed in terms of the density and its volume, m = PV. Hence, W = pVg. Step 1: Gather all materials. You will need: 7 dimes, a water bottle, a long plastic tube, a glue gun, a balloon. Step 3: Hot glue three dimes together and then hold glue the other four dimes together. Step 4: Hot glue the three dimes onto the rear end of the water bottle (the opposite side of where the cap is. Make sure that it is glued to the side of the water bottle where the holes are. Step 5: Hot glue the four dimes to the front end of the submarine (the side where the cap is). Make sure that it is glued to the side of the water bottle where the holes are. Step 7: Drill a hole in the bottle cap so that is big enough to fix your plastic tube. Step 8: attach a balloon to the end of the plastic tube. Step 9: Put your plastics tube through the bottle cap hole and attach with modeling clay. YOU ARE DONE YOU SUBMARINE!!! The title of our submarine is “Bobtcha”. We put 3 dimes at the back and 4 at the front to balance the weight of our submarine. The balloon inside is to allow the bottle to float, since air is less dense than water it floats in water. When the balloon fills up with air the bottle floats. The balloon is a simplified ballast tank for a submarine.